If the federal government is closed, our 6:30 a.m. class is canceled. All other classes will depend on the instructor's ability to safely get to the studio. Please be sure to check the schedule for any additional changes. And, please arrive to the studio a few minutes early as it does take time to un-bundle and get settled. 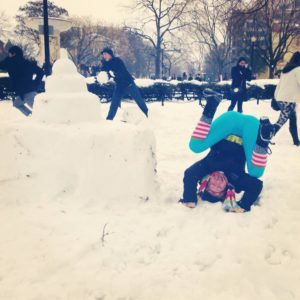 To make these cold, gray days a little cheerier, take the Snowga Challenge. Snap a picture of yourself or a friend striking your favorite yoga pose in the snow and post it on the Past Tense Facebook wall or tag us (@PastTenseStudio) and #SnowgaChallenge on Instagram and we'll send you your choice of discounts: 10% off a class pass or $5 off a workshop. One discount per person. Not applicable to memberships. 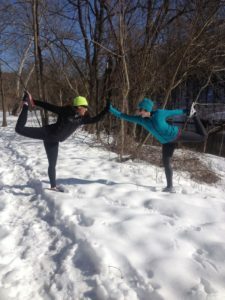 Snowga for Yoga runs through March 15 because we're optimistic we won't have snow after that.